The year has almost come to an end so it is time to share my favorite books read in 2014. I figured I might as well participate in the Best of 2014 Giveaway Hop too, so I can share one of these favorites with one of you! I'm going to present my favorite book in each of several categories, and the winner can choose one of these books as their prize. [NOTE: This giveaway has ended] This giveaway is open internationally to anyone who can receive books from The Book Depository. Note: I reserve the right to order through Amazon for U.S. residents if the price is better. **Affiliate links below in an effort to offset the cost of all of these giveaways I do! When Sarah Grimke turns 11 years old, her mother gives her a very special birthday gift: her very own slave, 10 year-old Handful. But Sarah is an unusual Southern girl who abhors slavery, even at her young age. She tries to refuse the gift, but her mother forces her to accept it. So she takes Handful as her handmaid, and they form a unique relationship that lasts a lifetime. Chris Harper has been dead for a year when Holly Mackey shows up in the squad room holding a card with a photo of Chris on it with the caption I KNOW WHO KILLED HIM. Detective Stephen Moran has a history with Holly so she has brought him this card, which she found on a board at St. Kilda's boarding school. The board is called the "Secret Place" and is meant for the girls to post their secret worries and thoughts anonymously. Now it's time to figure out who put up the card so they can finally solve the case. Sophie Collingwood knows everything about Jane Austen. She has read every book and loves everything about her. Recently graduated from Oxford, she takes a job at an antiquarian bookshop where she quickly gets two requests for the same obscure book. These requests start her on a journey to learn the truth about Jane Austen's Pride and Prejudice. When Gus Silva is a boy, his father who is known for his temper kills his mother in a rage. Gus, who was home when it happened, stopped talking. Only Hallie Costa, the local doctor's daughter could break his silence. Years later, they fall in love. But another act of violence tears them apart. The dystopian city of Chicago is composed of five factions. Each year, all of the 16 year olds are given an aptitude test to determine which of the five factions they belong in. These teens then choose the factions where they will live out the rest of their lives. It may be the one in which they grew up, or it may be another. Carson Fender is extremely bored with his life in North Dakota. Nothing exciting ever happens in his small town, so he has taken on the role of prankster in his middle school to liven things up a bit. But in the midst of his latest prank, a strange man runs up to him, hands him a package, tells him to deliver it to Mr. Jensen and runs off. Suddenly his school pranks don't seem so exciting. The Book with No Pictures by B.J. Novak is a fabulous book that is quickly becoming popular. It is meant to be read aloud by an adult to a child, but my daughter has been reading it aloud to everyone who will listen. The premise is that the reader has to read whatever is written on the page, even if it's gibberish. It's quite funny and holds everyone's interest, despite the lack of pictures. 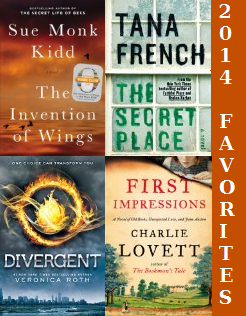 Visit these other blogs for more Best of 2014 books!